In a spice grinder or with a mortar and pestle, combine the coriander, fennel, oregano and pepper flakes; grind until mixture becomes a fine powder. Stir in salt. In a large bowl, combine the potatoes, oil and ground spices; toss to coat. Transfer to a greased 15-in. x 10-in. x 1-in. baking pan. Bake, uncovered, at 400° for 30-35 minutes or until crisp and golden brown, turning occasionally. 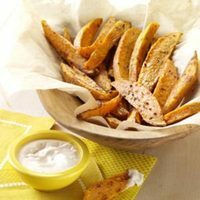 Serve the spicy mayo dip with fries.